After a sold-out Las Vegas season and a well-documented stint on America's Got Talent that culminated in viral success, comedian-come-mime artist Tape Face brings his new show to the West End. 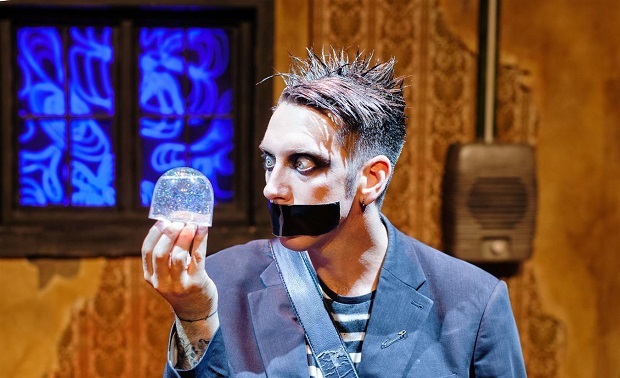 Set within a dilapidated dressing room on the Garrick stage, the show is literally what it says on the tin; a man (Sam Wills) with tape on his face. With no dialogue or one-liners to rely on, the show is a series of incredibly quirky physical sketches accompanied by cleverly thought-out music. Better known as The Boy with Tape on His Face, versions of his show are a popular ticket at the Fringe, and it's easy to see why. It's a twisted version of Charlie Chaplin; a very bizarre mime show that relies heavily on the quality of jokes. Luckily, after a rather elongated set up, the astoundingly inventive vignettes land well and are hits after hits. It all relies heavily on audience participation, which slightly elongates it, especially for those sat up in the circles, but it's charming and very, very funny. Comedy, in general, is a difficult task, and it's not often that you see this style of clowning in the West End. It's a niche act; a new brand of humour that features lots of music and soundscapes to support sketches that just don't want to be spoiled. There's surprise after surprise. True, some pace could be injected into the proceedings – there's a lot of preamble before the show really gets going and you kind of wish it was an hour and a half straight through – but it all feels worth it. Some may not find it whole-heartedly hilarious, but others may guffaw to tears and grip their seats with delight (I have to say I am part of the latter group). It might not be everyone's cup of tea, but you can't help but admire this wonderfully quirky comedian who carries the show on facial expressions alone. I, for one, think it is brilliant. 7 June 2017 - "surprise after surprise"